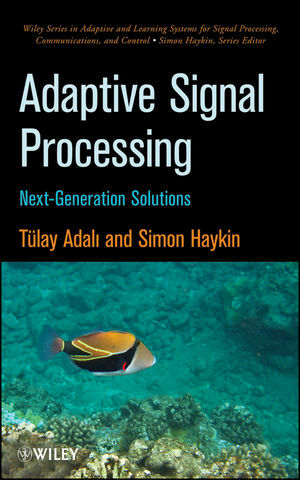 Tulay Adali and Simon Haykin, Adaptive Signal Processing: Next Generation Solutions, 424 pages, Wiley-IEEE Press, Hoboken, NJ, 2010. Recent developments in signal processing have made it clear that significant performance gains can be achieved beyond those achievable using standard adaptive filtering approaches. Adaptive Signal Processing presents the next generation of algorithms that will produce these desired results, with an emphasis on important applications and theoretical advancements. This highly unique resource brings together leading authorities in the field writing on the key topics of significance, each at the cutting edge of its own area of specialty. It begins by addressing the problem of optimization in the complex domain (by T. Adali and H. Li), fully developing a framework that enables taking full advantage of the power of complex-valued processing. Then, the challenges of multichannel processing of complex-valued signals are explored. This comprehensive volume goes on to cover Turbo processing, tracking in the subspace domain, nonlinear sequential state estimation, and speech-bandwidth extension. Eric Moreau and Tulay Adali, Blind Identification and Separation of Complex Signals, 112 pages, ISTE and Wiley, London, UK and Hoboken, NJ, 2013. Y. Levin-Schwartz, V. D. Calhoun, T. Adali, "Quantifying the Interaction and Contribution of Multiple Datasets in Fusion: Application to the Detection of Schizophrenia," IEEE Transactions on Medical Imaging, 2017. S. Bhinge, R. Mowakeaa, V. D. Calhoun, T. Adali, "Extraction of time-varying spatio-temporal networks using parameter-tuned constrained IVA," IEEE Transactions on Medical Imaging , accepted for publication. R. F. Silva, S. M. Pils, J. Sui, M. S. Pattichis, T. Adali, and V. D. Calhoun, "Blind source separation for unimodal and multimodal brain networks: A unifying framework for subspace modeling," IEEE Journal of Selected Topics in Signal Processing, vol. 10, no. 7, pp. 1134-1149, Oct. 2016. Y. Levin-Schwartz, Y. Song, P. J. Schreier, V. D. Calhoun, and T. Adali, "Sample-poor estimation of order and common signal subspace with application to fusion of medical imaging data," NeuroImage, vol. 134, pp. 486-493, July 2016. J. Xia, L. Bombrun, T. Adali, Y. Berthoumieu, and C. Germain, "Spectral-Spatial Classification of Hyperspectral Images Using ICA and Edge-Preserving Filter via an Ensemble Strategy," IEEE Trans. Geosci. Remote Sens., vol. 54, no. 8, pp. 4971-4982, May 2016. V. D. Calhoun and T. Adali, "Time-Varying Brain Connectivity in fMRI Data: Whole-brain data-driven approaches for capturing and characterizing dynamic states," IEEE Signal Processing Magazine, vol. 33, no. 3, pp. 52-66, May 2016. R. L. Miller. M. Yaesoubi, J. Turner, D. Mathalon, A. Preda, G. Pearlson, T. Adali, and V. D. Calhoun, "Higher Dimensional Meta-State Analysis Reveals Reduced Resting fMRI Connectivity Dynamism in Schizophrenia Patients," PLoS ONE, vol. 11, no. 3, pp. 1-24, March 16, 2016. W. Du, Y. Levin-Schwartz, G.-S. Fu, S. Ma, V. D. Calhoun, and T. Adali, "The role of diversity in complex ICA algorithms for fMRI analysis," Journal of Neuroscience Methods, vol. 264, pp. 129-135, March 15, 2016. D. Emge, F. Vialatte, G. Dreyfus, and T. Adali, "Independent vector analysis for SSVEP signal enhancement, detection, and topographical mapping," Brain Topography, March 3, 2016. G. Zhou, Q. Zhao, Y. Zhang, T. Adali, S. Xie, and A Cichocki, "Linked component analysis from matrices to high order tensors: Applications to biomedical data," Proc. IEEE, vol. 201, no. 2, pp. 310-331, Feb. 2016. S. Gopal, R. Miller, A. Michael, T. Adali, M. Cetin, J. Bustillo, S. A. Baum, and V. D. Calhoun, "Spatial variance in resting fMRI networks of schizophrenia patients: an independent vector analysis," Schizophrenia Bulletin, vol. 42, no. 1, pp. 152-160, Jan. 2016. Z. Boukouvalas, S. Said, L. Bombrun, Y. Berthoumieu, and T. Adali, "A new Riemannian averaged fixed-point algorithm for MGGD parameter estimation," IEEE Signal Proc. Letts., vol. 22, no. 12, pp. 2314-2318, Dec. 2015. T. Adali, Y. Levin-Schwartz, and V. D. Calhoun, "Multimodal data fusion using source separation: Two effective models based on ICA and IVA and their properties," Proc. IEEE, vol. 103, no. 9, pp. 1478-1493, Sep. 2015. T. Adali Y. Levin-Schwartz, and V. D. Calhoun, "Multimodal data fusion using source separation: Application to medical imaging," Proc. IEEE, vol. 103, no. 9, pp. 1494-1506, Sep. 2015. D. Lahat, T. Adali and C. Jutten, "Multimodal data fusion: An overview of methods, challenges, and prospects," Proc. IEEE, vol. 103, no. 9, pp. 1449-1477, Sep. 2015. V. D. Calhoun, R. Silva, T. Adali, and S. Rachakonda, "Comparison of PCA approaches for very large group ICA," NeuroImage, pp. 662-666, May 2015. J. Laney, T. Adali, S. McCombe Waller; and K. Westlake, "Quantifying motor recovery after stroke using independent vector analysis and graph-theoretical analysis," NeuroImage Clinical, no. 8, pp. 298-304, 2015. P. Acharjee, R. Phlypo, L. Wu, V. D. Calhoun, and T. Adali, "Independent vector analysis for gradient artifact removal in concurrent EEG-fMRI data," IEEE Trans. Biomed. Eng., vol. 62, no. 7, pp. 1750-1758, July 2015. J. Laney, K. Westlake, S. Ma, E. Woytowicz, V. D. Calhoun, and T. Adali, "Capturing subject variability in fMRI data: A graph-theoretical analysis of GICA vs IVA," Journal of Neuroscience Methods, vol. 247, pp. 32-40, May 2015. P. Rodriguez, M. Anderson, V. D. Calhoun, and T. Adali, "General nonunitary con- strained ICA and its application to complex-valued fMRI data," IEEE Trans. Biomed. Eng., vol. 62, no. 3, pp. 922-929, March 2015. G.-S. Fu, R. Phlypo, M. Anderson, and T. Adali, "Complex Independent Component Analysis Using Three Types of Diversity: Non-Gaussianity, Nonwhiteness, and Noncircularity," IEEE Trans. Signal Processing, vol. 63, no. 3, pp. 794-805, Feb. 2015. T. Adali, M. Anderson, and G.-S. Fu, "Diversity in independent component and vector analyses: Identifiability, algorithms, and applications in medical imaging," IEEE Signal Processing Magazine, vol. 31, no. 3, pp. 18-33, May 2014. T. Adali and P. J. Schreier,"Optimization and estimation of complex-valued signals: Theory and applications in filtering and blind source separation," IEEE Signal Processing Magazine, vol. 31, no. 5, pp. 112-128, Sep. 2014. G.-S. Fu, R. Phlypo, M. Anderson, X.-L. Li, and T. Adali, "Blind source separation by entropy rate minimization," IEEE Trans. Signal Processing, vol. 62, no. 16, pp. 4245-4255, Aug. 2014. G.-S. Fu, M. Anderson, and T. Adali, "Likelihood estimators for dependent samples and their application to order selection," IEEE Trans. Signal Processing, vol. 62, no. 16, pp. 4237-4244, Aug. 2014. M. Anderson, G.-S. Fu, R. Phlypo, and T. Adali, "Independent Vector Analysis: Identification Conditions and Performance Bounds," IEEE Trans. Signal Processing, vol. 62, no. 17, pp. 4399-4410, Sep. 2014. R. Silva, S. Pils, T. Adali, and V. D. Calhoun, "A statistically motivated framework for simulation of stochastic data fusion models applied to multimodal neuroimaging," NeuroImage, vol. 102, part 1, pp. 92-117, Nov. 2014. M. R. Arbabshirani, E. Damaraju, R. Phlypo, S. Plis, E. Allen, S. Ma, D. Mathalon, A. Preda, J. G. Vaidya, T. Adali, and V. D. Calhoun, "Impact of autocorrelation on functional connectivity," NeuroImage, vol. 102, part 2, pp. 294-308, Nov. 2014. V. D. Calhoun, R. Miller, G. Pearlson, and T. Adali, "The chronnectome: time-varying connectivity networks as the next frontier in fMRI data discovery," Neuron, vol. 84, no. 2, Oct. 22, 2014. D. Hjelm, R. Salakhutdinov, E. Allen, S. Pils, T. Adali, and V. D. Calhoun, "Restricted Boltzmann machines for neuroimaging: An application in identifying intrinsic networks," NeuroImage, vol. 96, pp. 245-260, August 2014. P. Rodriguez, M. Anderson, X.-L. Li, and T. Adali, "General non-orthogonal constrained ICA," IEEE Trans. Signal Processing, vol. 62, no. 11, pp. 2778-2786, June 2014. R. Arablouei, K. Dogancay, and T. Adali, "Unbiased recursive least-squares estimation utilizing dichotomous coordinate-descent iterations," IEEE Trans. Signal Processing, vol. 62, no. 11, pp. 2973-2983, June 2014. S. Ma, V. D. Calhoun, R. Phlypo, and T. Adali, "Dynamic changes of spatial functional network connectivity in healthy individuals and schizophrenia patients using independent vector analysis," NeuroImage, vol. 90, pp. 196-206, April 2014. X.-L. Li, and T. Adali, "Noncircular complex ICA by generalized Householder reflections," IEEE Trans. Signal Processing, vol. 61, no. 24, pp. 6423-6430, Dec. 2013. V. D. Calhoun, V. K. Potluru, R. Phlypo, R. F. Silva, B. A. Pearlmutter, A. Caprihan, S. M. Plis, and T. Adali, "Independent component analysis for brain fMRI does indeed select for maximal independence," PLoS ONE, vol. 8, no. 8: e73309. Q. Zhao, G. Zhou, T. Adali, L. Zhang, and A. Cichocki, "Kernelization of Tensor-based models for multimodal data analysis," IEEE Signal Processing Magazine, vol. 30, no. 4, pp. 137-148, July 2013. V. D. Calhoun and T. Adali, "Multi-subject independent component analysis of fMRI: A decade of intrinsic networks, Default Mode, and Neurodiagnostic Discovery," IEEE Reviews in Biomedical Engineering, invited contribution, vol. 5, pp. 60-73, 2012. V. D. Calhoun and T. Adali "Analysis of complex-valued functional magnetic resonance imaging data: Are we just going through a phase?" Scientific Quarterly Journal Bulletin of the Polish Academy of Sciences, invited contribution, vol. 60, no. 3, Dec. 2012. X.-L. Li, and T. Adali "Complex-valued linear and widely linear filtering using MSE and Gaussian entropy," IEEE Trans. Signal Processing, vol. 60, no. 11, Nov. 2012, pp. 5672-5684, Nov. 2012. S. Ma, V. D. Calhoun, T. Eichele, and T. Adali "Modulations of functional connectivity in healthy and schizophrenia groups during task and rest," NeuroImage, vol. 62, no. 3, pp. 1694-1704, Sep. 2012. W. Wang, T. Adali, and D. Emge, "A novel approach for target detection and classification using canonical correlation analysis," Signal Processing Systems for Signal, Image, and Video Technology, vol. 68, no. 3, pp. 379-390, Sep. 2012. M. Anderson, X.-L. Li, and T. Adali, "Complex-valued independent vector analysis: application to multivariate Gaussian model," Signal Processing, vol. 92, no. 8, pp. 1821-1831, Aug. 2012. M. Anderson, X.-L. Li, and T. Adali, "Joint blind source separation with multivariate Gaussian model: Algorithms and performance analysis," IEEE Trans. Signal Processing, vol. 60, no. 4, pp. 2049--2055, April 2012. H. Li, X-L. Li, M. Anderson, and T. Adali, "A class of adaptive algorithms based on entropy estimation achieving CRLB for linear non-Gaussian filtering," IEEE Trans. Signal Processing, ol. 60, no. 4, pp. 2049-2055, April 2012. M. Mboup and T. Adali, "A generalization of the Fourier transform and its application to spectral analysis of chirp-like signals," Applied and Computational Harmonic Analysis, vol. 32, no. 2, pp. 305-312, March 2012. P. Rodriguez, N. M. Correa, T. Eichele, V. D. Calhoun, and T. Adali, "Quality map thresholding for denoising of complex-valued fMRI data and its application to ICA of fMRI," Signal Processing Systems for Signal, Image, and Video Technology, vol.65, no. 3, pp. 497-508, Dec. 2011. T. Adali, D. J. Miller, K. Diamantaras, and J. Larsen, "Trends in Machine Learning for Signal Processing [In the Spotlight]," IEEE Signal Processing Magazine, vol. 28, no. 6, pp. 193-196, Nov. 2011. T. Adali, P. J. Schreier, and L. L. Scharf, "Complex-valued signal processing: The proper way to deal with impropriety," IEEE Trans. Signal Processing (overview paper), vol. 59, no. 11, pp. 5101-5123, Nov. 2011. M. Novey, E. Ollila, and T. Adali, "On testing the extent of noncircularity," IEEE Trans. Signal Processing, vol. 59, no. 11, pp. 5632-5637, Nov. 2011. X.-L. Li, T. Adali, and M. Anderson, "Noncircular principal component analysis and its application to model selection," IEEE Trans. Signal Processing, vol. 59, no. 10, pp. 4516-4528i, Oct. 2011. X.-L. Li, M. Anderson, and T. Adali "Joint blind source separation by generalized joint diagonalization of cumulant matrices," Signal Processing, vol. 91, no. 10, pp. 2314-2322, Oct. 2011. X.-L. Li and T. Adali, "Blind separation of noncircular correlated sources using Gaussian entropy rate," IEEE Trans. Signal Processing, vol.~59, no. 6, pp. 2969--2975, June 2011. H. Li and T. Adali, "Stability analysis and Newton algorithm for complex maximum likelihood ICA using Wirtinger calculus," IEEE Trans. Signal Processing, vol. 58, no. 12, pp. 6156--6167, Dec. 2010. The version that corrects the values of γ in Table II and restores a missing parentheses on page 7. X.-L. Li and T. Adali, "Independent component analysis by entropy bound minimization," IEEE Trans. Signal Processing, vol. 58, no. 10, pp. 5151-5164, Oct. 2010. X.-L. Li and T. Adali, "Complex independent component analysis by entropy bound minimization," IEEE Trans. Circuits and Systems I, vol. 57, no. 7, pp. 1417-1430, July 2010. M. Novey, T. Adali, and A. Roy, "A complex generalized Gaussian distribution- characterization, generation, and estimation," IEEE Trans. Signal Processing, vol. 58, no. 3, part. 1, pp. 1427-1433, March 2010. M. Novey, T. Adali, and A. Roy, " Circularity and Gaussianity detection using the complex generalized Gaussian distribution," IEEE Signal Proc. Letts., vol. 16, no. 11, pp. 993-996, Nov. 2009. J. Sui, T. Adali, G. Pearlson, V. D. Calhoun, An ICA-based method for the identification of optimal fMRI features and components using combined group-discriminative techniques, NeuroImage, vol. 46, no. 1, pp. 73-86, May 2009. W. Wang, T. Adali, and D. Emge, "Subspace partitioning for target detection and identification," IEEE Trans. Signal Processing, vol. 57, no. 4, April 2009. T. Adali, H. Li, M. Novey, and J.-F. Cardoso, "Complex ICA using nonlinear functions," IEEE Trans. Signal Processing, vol. 56, no. 9, pp. 4536--4544, Sept. 2008. M. Novey and T. Adali, "On extending the complex FastICA algorithm to noncircular sources," IEEE Trans. Signal Processing, vol. 56, no. 5, pp. 2148-2154, May 2008. H. Li and T. Adali, "Complex-valued adaptive signal processing using nonlinear functions," Journal on Advances in Signal Processing, Special issue on Emerging Machine Learning Techniques in Signal Processing, vol. 2008, Article ID 765615, 9 pages, 2008. H. Safavi, N. Correa, W. Xiong, A. Roy, T. Adali, V. R. Korostyshevskiy, C. C. Whisnant, and F. Seillier-Moiseiwitsch, "Independent component analysis of 2-D Electrophoresis gels", Electrophoresis, vol. 29, no. 19, pp. 4017--4026, 2008. M. Novey and T. Adali, "Complex ICA by negentropy maximization," IEEE Trans. Neural Networks, vol. 19, no. 4, pp. 596-609, April 2008. H. Li and T. Adali, "A class of complex ICA algorithms based on the kurtosis cost function," IEEE Trans. Neural Networks, vol. 19, no. 3, pp. 408-420, March 2008. T. Adali and V. D. Calhoun, " Complex ICA of brain imaging data," IEEE Signal Processing Mag., vol. 24, no. 5, pp. 136-139, Sept. 2007. W. Wang and T. Adali, "Detection using correlation bound in a linear mixture model," Signal Processing, vol. 87, pp. 1118-1127, 2007. Y.-O. Li, T. Adali, and V. D. Calhoun, "Estimating the number of independent components for fMRI data," Human Brain Mapping, vol. 28, pp. 1251-66, 2007. H. Li, T. Adali, W. Wang, D. Emge, and A. Cichocki, "Non-negative matrix factorization with orthogonality constraints and its application to Raman spectroscopy," VLSI Signal Processing Systems for Signal, Image, and Video Technology, vol. 48, nos. 1-2, pp. 83-97, August 2007. W. Xi and T. Adali, "Integrated MAP equalization and coding for optical fiber communications systems," Journal of Lightwave Tech., vol.24, no.10, pp.3663-3670, Oct. 2006. V. D. Calhoun and T. Adali, "Unmixing fMRI with independent component analysis," IEEE Engineering in Medicine and Biology Magazine, vol.25, no.2, pp.79-90, March/April 2006. V. D. Calhoun, T. Adali, K. A. Kiehl, R. Astur, J. J. Pekar, and G. D. Pearlson, "A method for multi-task fMRI data fusion applied to schizophrenia," Human Brain Mapping, vol. 27, no. 7, pp. 598-610, 2006. V. D. Calhoun and T. Adali, "Complex Infomax: Convergence and approximation of Infomax with complex nonlinearities," VLSI Signal Processing Systems for Signal, Image, and Video Technology, vol. 44, nos. 1/2, pp. 173-190, August 2006. V. D. Calhoun, T. Adali, G. D. Pearlson, and K. A. Kiehl, "Neuronal chronometry of target detection: Fusion of hemodynamic and event-related potential data," Neuroimage, vol. 30, no. 2, pp. 544-553, April 2006. V. D. Calhoun, T. Adali, N. R. Giuliani, J. J. Pekar, K. A. Kiehl, and G. D. Pearlson, "Method for multimodal analysis of independent source differences in schizophrenia: combining gray matter structural and auditory oddball functional data," Human Brain Mapping, vol. 27, no. 1, pp. 47-62, 2006. J. Xuan, Y. Wang, Q. Zheng, and T. Adali, "Discontinuity-embedded deformable models for surface reconstruction from range images," IEEE Signal Proc. Letts., vol. 12, no. 12, pp. 805-808, Dec. 2005. W. Xi, T. Adali, and J. Zweck, "A MAP equalizer for the optical communications channel," Journal of Lightwave Tech., vol. 23, no. 12, pp. 3989-3996, Dec. 2005. T. Adali and H. Ni, "Partial likelihood for online order selection," Signal Processing, Special Issue on Information Theoretic Signal Processing, vol. 85, no. 5, pp. 917-926, May 2005 (invited). V. D. Calhoun, T. Adali, M. Stevens, K. Kiehl and J. J. Pekar, "Semi-blind ICA of fMRI: A method for utilizing hypothesis-derived time courses in a spatial ICA analysis," Neuroimage, vol. 25, no. 2, pp. 527-538, April 2005. W. Wang and T. Adali, "Eigenanalysis of autocorrelation matrices in the presence of noncentral and signal-dependent noise," IEEE Signal Proc. Letts., vol. 12, no. 2, pp, 85-88, Feb. 2005. V. D. Calhoun, T. Adali, and J. J. Pekar, "A method for comparing group fMRI data using independent component analysis: Application to visual, motor, and visuomotor tasks," Magnetic Resonance Imaging, vol. 22, pp. 1181-1191, 2004. V. D. Calhoun, T. Adali, G. D. Pearlson, "Independent component analysis applied to fMRI data: A generative model for validating results," VLSI Signal Processing Systems for Signal, Image, and Video Technology, Double Special Issue: Biomedical and Communications Applications of Neural Networks, vol. 37, no. 2/3, pp. 281-291, June/July 2004. B. Wang and T. Adali, "A frequency-domain training approach for equalization and noise suppression in discrete multitone systems," Signal Processing, vol. 84, no. 2, pp. 327-339, 2004. V. D. Calhoun, T. Adali, J. J. Pekar, G. D. Pearlson, "Latency (in)sensitive ICA: Group independent component analysis of fMRI data in the temporal frequency domain," Neuroimage, vol. 20, no. 3, pp. 1661-1669, Nov. 2003. T. Kim and T. Adali, "Approximation by fully-complex multilayer perceptrons," Neural Computation, vol. 15, no. 7, pp. 1641-1666, July 2003. A. O. Lima, I. T. Lima, Jr., C. R. Menyuk, and T. Adali, "Comparison of power penalties due to first- and all-order PMD distortions in optical fiber transmission systems," Optics Letts., vol. 28, no. 5, pp. 310-312, 2003. Y. Cai, J.M. Morris, T. Adali, and C.R. Menyuk, "On Turbo code decoder performance in optical fiber communication systems with dominating ASE noise", Journal of Lightwave Tech., vol. 21, no. 3, pp. 727-734, March 2003. T. Adali and H. Ni, "Partial likelihood for real-time signal processing," IEEE Trans. Signal Proc., vol. 51, no. 1, pp. 204-212, Jan.2003. T. Kim and T. Adali, "Fully complex multilayer perceptron for nonlinear signal processing," Journal of VLSI Signal Processing Systems for Signal, Image, and Video Technology, Special Issue: Neural Networks for Signal Processing, vol. 32, pp. 29-43, Aug.-Sep. 2002. V. D. Calhoun, T. Adali, G. D. Pearlson, P. C. M. van Zijl, and J. J. Pekar, "Independent component analysis of fMRI data in the complex domain," Magnetic Resonance in Medicine, vol. 48, issue 1, pp. 180-192, July 2002. V. D. Calhoun, J. J. Pekar, V. B. McGinty, T. Adali, T. D. Watson, and G. D. Pearlson, "Different activation dynamics in multiple neural systems during simulated driving," Human Brain Mapping, vol. 16, no. 3, July 2002. A. O. Lima, I. T. Lima, Jr., T. Adali, and C. R. Menyuk, "A novel polarization diversity receiver for PMD mitigation," IEEE Photonics Technology Letters, vol. 14, no. 4, pp. 465-467, April 2002. Y. Cai, T. Adali, J. M. Morris, and C. R. Menyuk, "Sliding window criterion codes and concatenation scheme for mitigating timing jitter induced errors in WDM optical fiber transmissions," Journal of Lightwave Tech., vol. 20, no. 2, pp. 201-212, Feb. 2002. J. Xuan, T. Adali, Y. Wang, W. Hayes, J. Lynch, M. Freedman, and S. K. Mun, "A computerized simulation system for prostate needle biopsy," Simulation and Gaming, Special issue on Medical and Healthcare Simulation, Part 2, vol. 32, no. 3, pp. 391-403, Sep. 2001. Y. Wang, T. Adali, J. Xuan, Z. Szabo, "Magnetic resonance image analysis by information theory and stochastic site model," IEEE Trans. Information Technology in Biomedicine, vol. 5, no. 2, pp. 150-158, June 2001. V. D. Calhoun, T. Adali, M. Kraut, and G. Pearlson, "Spatial versus temporal independent component analysis of functional MRI data containing a pair of task-related waveforms," Human Brain Mapping, vol. 13, pp. 43-53, 2001. V. D. Calhoun, T. Adali, G. D. Pearlson, and J. J. Pekar, "A method for making group inferences from functional MRI data using independent component analysis," Human Brain Mapping, vol. 14, pp. 140-151, 2001. V. D. Calhoun, T. Adali, V. McGinty, J. Pekar, T. Watson, and G. Pearlson, "fMRI activation in a visual perception task: network of areas detected using the general linear model and independent component analysis", Neuroimage, vol. 14, pp. 1080-1088, 2001. J. Xuan, T. Adali, Y. Wang, and E. Siegel, "Automatic detection of foreign objects in computed radiography," Journal of Biomedical Optics, vol. 5, no. 4, pp. 425-431, Oct. 2000. V. D. Calhoun, T. Adali, M. Kraut, and G. Pearlson, "A weighted least squares algorithm for estimation and visualization of real event related functional MRI," Magnetic Resonance in Medicine, vol. 44, pp. 947-954, 2000. H. Ni, T. Adali, B. Wang, and X. Liu, "A general probabilistic formulation for supervised neural classifiers," Journal of VLSI Signal Processing Systems for Signal, Image, and Video Technology, Special Issue: Neural Networks for Signal Processing, vol. 26, nos. 1/2, pp. 141-153, Aug. 2000 (invited). T. Adali and S. H. Ardalan, "On Steady-state performance of the fixed-point RLS algorithm," Computers and Electrical Engineering, vol. 25, no. 1, pp. 1-16, Jan. 1999. T. Adali, B. Bakal, M. K. Sönmez, and R. Fakory, "NOx and CO prediction with variable tapped delay line neural networks," Journal of Integrated Computer-Aided Engineering, Special Issue on Neural Techniques for Industrial Applications, vol. 6, no. 1, pp. 27-39, 1999. T. Adali, Y. Wang, and N. Gupta, "A block-wise relaxation labeling scheme and its application to edge detection in cardiac MR image sequences," International Journal of Imaging Systems, Special Issue on Image Sequence Processing, vol. 9, pp. 340-350, Oct. 1998. T. Adali, B. Wang, A. N. Pilipetskii, and C. R. Menyuk, "A filtering approach for reducing timing jitter due to the acoustic effect" Journal of Lightwave Tech., vol. 16, no. 6,pp. 986-989, June 1998. Y. Wang, T. Adali, C. Lau, and S.-Y. Kung, "Quantitative analysis of MR brain image sequences by adaptive self-organizing mixtures," Journal of VLSI Signal Processing Systems for Signal, Image, and Video Technology, Special Issue: Neural Networks for Biomedical Image Processing, vol. 18, no. 3, pp. 219-239, Apr. 1998. T. Adali and X. Liu, "Canonical piecewise linear network for nonlinear adaptive filtering and its application to blind equalization," Signal Processing, vol. 61, no. 2, pp. 145-155, Sep. 1997. T. Adali, X. Liu, and M. K. Sönmez, "Conditional distribution learning with neural networks and its application to channel equalization," IEEE Trans. Signal Processing, vol. 45, no. 4, pp. 1051-1064, Apr. 1997. Y. Wang, T. Adali, and S. C. B. Lo, "Automatic threshold selection using histogram quantization," Journal of Biomedical Optics, vol. 2, no. 2, pp. 211-217, Apr. 1997. T. Adali, B. Bakal, M. K. Sönmez, R. Fakory, and O. Tsaoi, "Modeling core neutronics with recurrent neural networks," Neurocomputing, Special Issue on Recurrent Networks for Sequence Processing, vol 15, pp. 363-381, 1997. T. Adali and S. H. Ardalan, "On the effect of input signal correlation on weight misadjustment in the RLS algorithm," IEEE Trans. Signal Processing, vol. 43, no. 4, pp. 988-991, Apr. 1995. T. Adali and S. H. Ardalan, "Analysis of a stabilization technique for the fixed-point prewindowed RLS algorithm," IEEE Trans. Signal Processing, vol. 39, no. 9, pp. 2079-2082, Sep. 1991. V. D. Calhoun and T. Adalı, ICA for Fusion of Brain Imaging Data, Signal Processing Techniques for Knowledge Extraction and Information Fusion, D. Mandic, M. Golz, A. Kuh, D. Obradovic, and T. Tanaka, (editors), Springer, 2008. T. Adalı and Y. Wang, Image Analysis and Graphics for Multimedia Presentation, Multimedia Image and Video Processing, L. Guan, S.-Y Kung, and J. Larsen (editors), CRC Press: Boca Raton, FL, 2000, pp. 201--241. T. Adalı, Y. Wang, and H. Li, Applications of Neural Networks in Biomedical Signal Processing, (Chapter 12), Handbook of Neural Network Signal Processing, Y. H. Hu and J.-N. Hwang (editors), CRC Press, 2002, pp. 12-1  12-28. Y. Wang and T. Adalı, Stochastic Model Based Image Analysis, Signal Processing for Magnetic Resonance Imaging and Spectroscopy, H. Yan editor, Marcel Dekker, 2002, pp. 365  399. Y. Cai, T. Adalı, and C. R. Menyuk, "Error mitigation system using line coding for optical WDM communications," patent no. 7,016,606, issued 2006. W. Xi and T. Adalı, “Integrated MAP equalization and turbo product coding for optical fiber communications systems,” patent application, June 21, 2006, application no: 11/471,717. B. Wang and T. Adalı, “Method for equalization in multicarrier communication systems,” invention disclosure TRN no. 2318TA, provisional patent filing date 7/14/99, application no. 60/143,640. B. Wang and T. Adalı, “Optimized equalizer for multicarrier communication systems,” invention disclosure TRN no. 2319TA, provisional patent filing date 7/14/99, application no. 60/143,641. T. Adalı, A. Mishra, and M. K. Sönmez, “Adaptive troubleshooting with Bayesian belief networks,” invention disclosure TRN no. 2304TA, provisional patent filing date 7/12/99, application no. 60/143,997. Q. Long, C. Jia, Z. Boukouvalas, B. Gabrielson, D. Emge and T. Adali, "Consistent Run Selection for Independent Component Analysis: Application to Fmri Analysis," in International Conference on Acoustics, Speech and Signal Processing (ICASSP), Calgary, AB, 2018, pp. 2581-2585. S. Bhinge, V. D. Calhoun, and T. Adali, "IVA-Based Spatio-Temporal Dynamic Connectivity Analysis in Large-Scale fMRI Data," in International Conference on Acoustics, Speech and Signal Processing (ICASSP), Calgary, AB, 2018, pp. 965-969. M. A. B. S. Akhonda, Y. Levin-Schwartz, S. Bhinge, V. D. Calhoun and T. Adali, "Consecutive Independence and Correlation Transform for Multimodal Fusion: Application to EEG and fMRI Data," in International Conference on Acoustics, Speech and Signal Processing (ICASSP), Calgary, AB, 2018, pp. 2311-2315. X. Song, S. Bhinge, R. Quiton and T. Adali, "A two-level ICA approach reveals important differences in the female brain response to thermal pain," in 15th International Symposium on Biomedical Imaging (ISBI), Washington, DC, 2018, pp. 1377-1380. S. Bhinge, Y. Levin-Schwartz, and T. Adali, "Estimation of common subspace order across multiple datasets: Application to multi-subject fMRI data," in Proc. Conf. on Info. Sciences and Systems (CISS), Baltimore, MD, March 2017. Q. Long, S. Bhinge, Y. Levin-Schwartz, V. D. Calhoun, and T. Adali, "A graph theoretical approach for performance comparison of ICA for fMRI analysis," in Proc. Conf. on Info. Sciences and Systems (CISS), Baltimore, MD, March 2017. D. Emge, Z. Boukouvalas, Y. Levin-Schwartz, S. Bhinge, Q. Long, and T. Adali, "Power spectra constrained IVA for enhanced detection of SSVEP content," in Proc. Conf. on Info. Sciences and Systems (CISS), Baltimore, MD, March 2017. Z. Boukouvalas, Y. Levin-Schwartz, and T. Adali, "Enhancing ICA performance by exploiting sparsity:Application to FMRI analysis," in Proc. IEEE Int. Conf. Acoust., Speech, Signal Processing (ICASSP), New Orleans, LA, March 2017, 5 pages. Y. Levin-Schwartz, V. D. Calhoun, and T. Adali, "Two models for fusion of medical imaging data: Comparison and connections," in Proc. IEEE Int. Conf. Acoust., Speech, Signal Processing (ICASSP), New Orleans, LA, March 2017, 5 pages. S.-J. Kim, V. D. Calhoun,and T. Adali, "Flexible large scale fMRI analysis: A survey," in Proc. IEEE Int. Conf. Acoust., Speech, Signal Processing (ICASSP), New Orleans, LA, March 2017, 5 pages. S. Bhinge, Q. Long, Y. Levin-Schwartz, Z. Boukouvalas,, V. Calhoun, and T. Adali, "Non-orthogonal constrained independent vector analysis: Application to data fusion," in Proc. IEEE Int. Conf. Acoust., Speech, Signal Processing (ICASSP), New Orleans, LA, March 2017, 5 pages. S. Bhinge, Z. Boukouvalas, Y. Levin-Schwartz, and T. Adali, "Data-driven fusion of multi-camera video sequences: Application to abandoned object detection," in Proc. IEEE Int. Conf. Acoust., Speech, Signal Processing (ICASSP), New Orleans, LA, March 2017, 5 pages. Y. Levin-Schwartz, D. Sparta, J. Cheer, and T. Adali, "Parameter-free automated extraction of neuronal signals from calcium imaging data," in Proc. IEEE Int. Conf. Acoust., Speech, Signal Processing (ICASSP), New Orleans, LA, March 2017, 5 pages. R. Mowakeaa, Z. Boukouvalas, C. C. Cavalcante, T. Adali, "On the characterization, generation, and efficient estimation of the complex multivariate GGD," in Proc. IEEE 9th Sensor Array and Multichannel Signal Processing Workshop (SAM), Rio de Janeiro, Brazil, July 2016. J. Xia, L. Bombrun, T. Adali, Y. Berthoumieu, and C. Germain, "Classification of hyperspectral data with ensemble of subspace ICA and edge-preserving filtering," in Proc. IEEE Int. Conf. Acoust., Speech, Signal Processing (ICASSP), Shanghai, China, March 2016, pp. 1422-1426. M. Yaesoubi, R. L. Miller, T. Adali, and V. D. Calhoun, "Time-varying frequency modes of resting fMRI brain networks reveal significant gender differences," in Proc. IEEE Int. Conf. Acoust., Speech, Signal Processing (ICASSP), Shanghai, China, March 2016, pp. 6310-6314. S. Bhinge, Z. Boukouvalas, Y. Levin-Schwartz, and T. Adali, "IVA for abandoned object detection: Exploiting dependence across color channels," in Proc. IEEE Int. Conf. Acoust., Speech, Signal Processing (ICASSP), Shanghai, China, March 2016, pp. 2494-2498. S. Bhinge, Y. Levin-Schwartz, G.-S. Fu, B. Pesquet-Popescu, and T. Adali, "A data-driven solution for abandoned object detection: Advantages of multiple types of diversity," in Proc. Global Signal Processing Conf. (GlobalSIP), Orlando, FL, Dec. 2015, to appear. G.-S. Fu, Z. Boukouvalas, and T. Adali, "Density estimation by entropy maximization with kernels," in Proc. IEEE Int. Conf. Acoust., Speech, Signal Processing (ICASSP), Brisbane, Australia, April 2015. G.-S. Fu, M. Anderson, and T. Adali, "Independent vector analysis by entropy rate bound minimization," in Proc. Conf. on Info. Sciences and Systems (CISS), Baltimore, MD, March 2015. Z. Boukouvalas, G.-S. Fu, and T. Adali, "An efficient multivariate generalized Gaussian distribution estimator: Application to IVA," in Proc. Conf. on Info. Sciences and Systems (CISS), Baltimore, MD, March 2015. D. Emge, F. Vialatte, G. Dreyfus, and T. Adali, "Independent vector analysis for SSVEP signal enhancement," in Proc. Conf. on Info. Sciences and Systems (CISS), Baltimore, MD, March 2015. D. Lahat, T. Adali, and C. Jutten, "Challenges in multimodal data fusion," in Proc. European Signal Processing Conference (EUSIPCO), Lisbon, Portugal, Sep. 2014. R. Arablouei, K. Dogancay, and T. Adali, "Unbiased RLS identification of errors-in-variables models in the presence of correlated noise," in Proc. European Signal Processing Conference (EUSIPCO), Lisbon, Portugal, Sep. 2014. W. Du, G.-S. Fu, V. D. Calhoun, and T. Adali, "Performance of complex-valued ICA algorithms for fMRI analysis: Importance of taking full diversity into account," in Proc. IEEE Int. Conf. on Image Processing (ICIP), Paris, France, Oct. 2014. G.-S. Fu, W. Du, and T. Adali, "Entropy rate estimation for vector processes: Application to complex fMRI analysis," in Proc. IEEE Int. Conf. on Image Processing (ICIP), Paris, France, Oct. 2014, Top 10% Paper Award. R. Silva, S. M. Pils, T. Adali, and V. D. Calhoun, "Multidataset independent subspace analysis extends independent vector analysis," in Proc. IEEE Int. Conf. on Image Processing (ICIP), Paris, France, Oct. 2014. S. Gopal, R. Miller, A. Michael, T. Adali, S. A. Baum, and V. D. Calhoun, "A study of spatial variation in fMRI brain networks via independent vector analysis: Application to schizophrenia," in Proc. Pattern Recognition in Neuroimaging, Tubingen, Germany, June 2014. T. Adali, M. Anderson, G. Fu, "ICA and IVA: Theory, connections, and applications to medical imaging," in Proc. Int. Conf. Systems, Signals and Image Processing (IWS-SIP), Dubrovnik, Croatia, May 2014. G.-S. Fu, R. Phlypo, M. Anderson, X.-L. Li, and T. Adali, "An efficient entropy rate estimator for complex-valued signal processing: Application to ICA," in Proc. IEEE Int. Conf. Acoust., Speech, Signal Processing (ICASSP), Florence, Italy, May 2014. P. Acharjee, R. Phlypo, L. Wu, V. Calhoun, and T. Adali, "Gradient artifact removal in concurrently acquired EEG data using independent vector analysis," in Proc. IEEE Int. Conf. Acoust., Speech, Signal Processing (ICASSP), Florence, Italy, May 2014. W. Du, S. Ma, G.-S. Fu, V.D. Calhoun, and T. Adali, "A novel approach for assessing reliability of ICA for fMRI analysis," in Proc. IEEE Int. Conf. Acoust., Speech, Signal Processing (ICASSP), Florence, Italy, May 2014. D. Emge and T. Adali, "Multiset singular value decomposition for joint analysis of multi modal data: Application to fingerprint analysis," in Proc. SPIE DSS, Baltimore, MD, May 2014. J. Laney, K. Westlake, S. Ma, E. Woytowicz, and T. Adali, "Capturing subject variability in data-driven fMRI Analysis: A graph-theoretical comparison," in Proc. Conf. on Info. Sciences and Systems (CISS), Princeton, NJ, March 2014. D. Bradley, J. M. Morris, T. Adali, M. Aksoy, J. T. Johnson, "On the detection of RFI using the complex signal kurtosis in microwave radiometry," in Proc. 13th Mtg. Microwave Radiometry and Remote Sensing of the Environment, Pasadena, CA, March 2014. M. Anderson, G. Fu, R.Phlypo, and T. Adali, "Independent vector analysis, the Kotz distribution, and performance bounds," in Proc. IEEE Int. Conf. Acoust., Speech, Signal Processing (ICASSP), Vancouver, BC, Canada, May 2013. G. Fu, R.Phlypo, M. Anderson, and T. Adali, "Algorithms for Markovian source separation by entropy rate minimization," in Proc. IEEE Int. Conf. Acoust., Speech, Signal Processing (ICASSP), Vancouver, BC, Canada, May 2013. S. Ma, R.Phlypo, V.D. Calhoun, and T. Adali, "Capturing group variability using IVA: A simulation study and graph-theoretical analysis," in Proc. IEEE Int. Conf. Acoust., Speech, Signal Processing (ICASSP), Vancouver, BC, Canada, May 2013. W. Du, R.Phlypo, and T. Adali, "Adaptive feature split selection for co-training: Application to tire irregular wear classification," in Proc. IEEE Int. Conf. Acoust., Speech, Signal Processing (ICASSP), Vancouver, BC, Canada, May 2013. Q. Zhao, G. Zhou, T. Adali, L. Zhang, and A. Cichocki, "Kernel-based tensor partial least squares for reconstruction of limb movements," in Proc. IEEE Int. Conf. Acoust., Speech, Signal Processing (ICASSP), Vancouver, BC, Canada, May 2013. P. Rodriguez, V. D. Calhoun, and T. Adali, "Complex-valued analysis and visualization of fMRI data for event-related and block-design paradigms," in Proc. IEEE Workshop on Machine Learning for Signal Processing (MLSP), Santander, Spain, Sep. 2012 (6 pages). T. Adali M. Anderson, G. Fu, "IVA and ICA: Use of diversity in independent decompositions," in Proc. European Signal Processing Conference (EUSIPCO), Bucharest, Romania, August 2012. J. Sui, T. Adali G. Pearlson, and V. D. Calhoun, "FMRI-DTI-Methylation data fusion based on mCCA+jICA and its application to schizophrenia," in Proc. Int. Conf. IEEE Engineering in Medicine and Biology Society (EMBC), San Diego, CA, Aug.-Sep. 2012. M. Anderson, X.-L. Li, P. R. Rodriguez, and T. Adali, "An effective decoupling method for matrix optimization and its application to the ICA problem," in Proc. IEEE Int. Conf. Acoust., Speech, Signal Processing (ICASSP), Kyoto, Japan, March 2012. G. Fu, H. Li, M. Anderson, and T. Adali, "Order selection for dependent samples using entropy rate," in Proc. IEEE Int. Conf. Acoust., Speech, Signal Processing (ICASSP), Kyoto, Japan, March 2012. J. Via, X.-L. Li, M. Anderson, and T. Adali, "A maximum likelihood approach for independent vector analysis of Gaussian data sets," in Proc. IEEE Workshop on Machine Learning for Signal Processing (MLSP), Beijing, China, Sep. 2011 (6 pages). J. T. Dea, M. Anderson, E. Allen, V. D. Calhoun, and T. Adali, "IVA for multi-subject fMRI analysis: A comparative study using a new simulation toolbox," in Proc. IEEE Workshop on Machine Learning for Signal Processing (MLSP), Beijing, China, Sep. 2011 (6 pages). J. Via, M. Anderson, X.-L. Li, and T. Adali, "Joint blind source separation from second-order statistics: Necessary and sufficient identifiability conditions," in Proc. IEEE Int. Conf. Acoust., Speech, Signal Processing (ICASSP) , Prague, May 2011. X.-L. Li and T. Adali, "Complex-valued Gaussian signal processing: optimality of MSE, incorporation of full statistics, and a unified view," in Proc. Conf. on Info. Sciences and Systems (CISS), Baltimore, MD, March 2011. H. Li, X.-L. Li, and T. Adali, "A class of adaptive algorithms based on ML for non-Gaussian system identification," in Proc. Conf. on Info. Sciences and Systems (CISS), Baltimore, MD, March 2011. X.-L. Li, S. Ma, V. D. Calhoun, and T. Adali, "Order detection for fMRI analysis: Joint estimation of downsampling depth and order by information-theoretic criteria," in Proc. IEEE Int. Symp. Biomedical Imaging, Chicago, IL, March-April 2011. S. Khullar, A. Michael, N. Correa, T. Adali, S. Baum, V. Calhoun, "Wavelet-based denoising and independent component analysis for improving multi-group inference in fMRI data," in Proc. IEEE Int. Symp. Biomedical Imaging, Chicago, IL, March-April 2011. S. Ma, T. Eichele, N. Correa, V. Calhoun, T. Adali, "Hierarchical and graphical analysis of fMRI network connectivity in healthy and schizophrenic groups," in Proc. IEEE Int. Symp. Biomedical Imaging, Chicago, IL, March-April 2011. W. Du, H. Li, X.-L. Li, V. Calhoun, and T. Adali, "ICA of fMRI data: Performance of three ICA algorithms and the importance of taking correlation information into account," in Proc. IEEE Int. Symp. Biomedical Imaging, Chicago, IL, March-April 2011. X.-L. Li, M. Anderson, and T. Adali, "Principal component analysis of noncircular signals in the presence of circular white Gaussian noise," in Proc. 44th Asilomar Conf. on Signals, Systems and Computers, Pacific Grove, CA, Nov. 2010. X.-L. Li, M. Anderson, and T. Adali, "Second and higher-order correlation analysis of multiple multidimensional variables by joint diagonalization," in Proc. 2010 Conf. Latent Variable Analysis and Independent Component Analysis (LVA/ICA), St. Malo, France, Sep. 2010. M. Anderson, T. Adali, and X.-L. Li, "Nonorthogonal independent vector analysis using multivariate Gaussian model," in Proc. 2010 Conf. Latent Variable Analysis and Independent Component Analysis (LVA/ICA), St. Malo, France, Sep. 2010. M. Anderson, and T. Adali, "A general approach for robustification of ICA algorithms," in Proc. 2010 Conf. Latent Variable Analysis and Independent Component Analysis (LVA/ICA), St. Malo, France, Sep. 2010. T. Trainini, X.-L. Li, E. Moreau, and T. Adali, "A relative gradient algorithm for joint decompositions of complex matrices," in Proc. 2010 European Signal Processing Conference (EUSIPCO), Aalborg, Denmark, August 2010. X.-L. Li, and T. Adali, "Blind spatiotemporal separation of second and/or higher-order correlated sources by entropy rate minimization," in Proc. IEEE Int. Conf. Acoust., Speech, Signal Processing (ICASSP), Dallas, TX, March 2010. X.-L. Li, and T. Adali, "Flexible adaptive filtering by minimization of error entropy bound and its application to system identifcation," in Proc. IEEE Int. Conf. Acoust., Speech, Signal Processing (ICASSP), Dallas, TX, March 2010. N. M. Correa, T. Eichele, T. Adali, Y.-O. Li, V. D. Calhoun, "Fusion of concurrent single trial EEG data and fMRI data using multi-set canonical correlation analysis," in Proc. IEEE Int. Conf. Acoust., Speech, Signal Processing (ICASSP), Dallas, TX, March 2010. H. Li, T. Adali, N. M. Correa, P. Rodriguez, V. D. Calhoun, "Flexible complex ICA of fMRI data," in Proc. IEEE Int. Conf. Acoust., Speech, Signal Processing (ICASSP), Dallas, TX, March 2010. S. Ma, X.-L. Li, N. M. Correa, T. Adali, V. D. Calhoun, "Independent subspace analysis with prior information for fMRI data," in Proc. IEEE Int. Conf. Acoust., Speech, Signal Processing (ICASSP), Dallas, TX, March 2010. P. A. Rodriguez, T. Adali, H. Li, N. M. Correa, V. D. Calhoun, "Phase correction and denoising for ICA of complex fMRI data," in Proc. IEEE Int. Conf. Acoust., Speech, Signal Processing (ICASSP), Dallas, TX, March 2010. J. Sui, T. Adali, Y. O. Li, H. H. Yang, V. D. Calhoun, "A review of multivariate methods in brain imaging data fusion," in Proc. Conf. Medical Imaging, Biomedical Applications in Molecular, Structural, and Functional Imaging, Feb. 2010. P. A. Rodriguez, N. M. Correa, T. Adali, and V. D. Calhoun, "Quality map thresholding for de-Noising of complex-valued fMRI data and its application to ICA of fMRI," in Proc. IEEE Workshop on Machine Learning for Signal Processing (MLSP), Grenoble, France, Sep. 2009. X.-L. Li and T. Adali, "A novel entropy estimator and its application to ICA," in Proc. IEEE Workshop on Machine Learning for Signal Processing (MLSP), Grenoble, France, Sep. 2009. T. Adali, H. Li, and R. Aloysius, "On properties of the widely linear MSE filter and its LMS implementation," in Proc. Conf. on Info. Sciences and Systems (CISS), Baltimore, MD, March 2009. P. Schreier, T. Adali, and L. Scharf, "On ICA of improper and noncircular sources," in Proc. IEEE Int. Conf. Acoust., Speech, Signal Processing (ICASSP), Taipei, Taiwan, April 2009. N. Correa, Y.-O. Li, T. Adali, and V. D. Calhoun, "Fusion of fMRI, sMRI, and EEG data using canonical correlation analysis," in Proc. IEEE Int. Conf. Acoust., Speech, Signal Processing (ICASSP), Taipei, Taiwan, April 2009. M. Novey and T. Adali, "Using complex-valued ICA to effciently combine radar polarimetric data for target detection," in Proc. IEEE Int. Conf. Acoust., Speech, Signal Processing (ICASSP), Taipei, Taiwan, April 2009. N. Correa, Y.-O. Li, T. Adali, and V. Calhoun, "Examining associations between fMRI and EEG data using canonical correlation analysis," in Proc. IEEE Int. Symp. Biomedical Imaging, Paris, France, May 2008. H. Li and T. Adali, "Stability analysis of complex maximum likelihood ICA using Wirtinger calculus," in Proc. IEEE Int. Conf. Acoust., Speech, Signal Processing (ICASSP), Las Vegas, Nevada, April 2008. M. Novey and T. Adali, "On quantifying the effects of noncircularity on the complex FastICA algorithm," in Proc. IEEE Int. Conf. Acoust., Speech, Signal Processing (ICASSP), Las Vegas, Nevada, April 2008. Y.-O. Li, W. Wang, T. Adali, V. D. Calhoun, "CCA for joint blind source separation of multiple datasets with application to group fMRI analysis," in Proc. IEEE Int. Conf. Acoust., Speech, Signal Processing (ICASSP), Las Vegas, Nevada, April 2008. W. Xiong, Y.-O. Li, H. Li, T. Adali, and V. D. Calhoun, "On ICA of complex-valued fMRI: Advantages and order selection," in Proc. IEEE Int. Conf. Acoust., Speech, Signal Processing (ICASSP), Las Vegas, Nevada, April 2008. W. Wang, T. Adali, and D. Emge, "Target detection and identification using canonical correlation analysis and subspace partitioning," in Proc. IEEE Int. Conf. Acoust., Speech, Signal Processing (ICASSP), Las Vegas, Nevada, April 2008. L. Xu, J. Liu, T. Adali, and V. D. Calhoun, "Source based morphometry using structural MRI phase images to identify sources of gray matter and white matter relative differences in schizophrenia versus controls," in Proc. IEEE Int. Conf. Acoust., Speech, Signal Processing (ICASSP), Las Vegas, Nevada, April 2008. J. Sui, J. Liu, L. Wu, A. Michael, L. Xu, T. Adali, and V. D. Calhoun, "A constrained coefficient ICA algorithm for group difference enhancement," in Proc. IEEE Int. Conf. Acoust., Speech, Signal Processing (ICASSP), Las Vegas, Nevada, April 2008. W. Wang, T. Adali, and D. Emge, "Library partitioning for target detection in joint contaminated surface detector," in Proc. Scientific Conference on Chemical and Biological Defense Research, Edgewood, MD, Nov. 2007. Y.-O. Li and T. Adali, "A multivariate model for comparison of two datasets and its application to fMRI analysis," in Proc. IEEE Workshop on Machine Learning for Signal Processing (MLSP), Thessaloniki, Greece, Aug. 2007. W. Wang, T. Adali, and D.Emge, "Unsupervised target detection using canonical correlation analysis and its application to Raman spectroscopy," in Proc. IEEE Workshop on Machine Learning for Signal Processing (MLSP), Thessaloniki, Greece, Aug. 2007. T. Adali and H. Li, "A practical formulation for computation of complex gradients and its application to maximum likelihood," in Proc. IEEE Int. Conf. Acoust., Speech, Signal Processing (ICASSP), Honolulu, Hawaii, April 2007. M. Novey and T. Adali, “ Complex fixed-point ICA algorithm for separation of QAM sources using Gaussian mixture model,” in Proc. IEEE Int. Conf. Acoust., Speech, Signal Processing (ICASSP), Honolulu, Hawaii, April 2007. H. Li and T. Adali, "Optimization in the complex domain for nonlinear adaptive filtering," 40th Asilomar conference on Signals, Systems and Computers, San Jose, 2006. H. Li and T. Adali, "Gradient and fixed-point complex ICA algorithms based on kurtosis maximization," in Proc. IEEE Workshop on Machine Learning for Signal Processing (MLSP), Maynooth, Ireland, pp. 85-90, Sep. 2006. M. Novey and T. Adali, "Adaptable nonlinearity for complex maximization of nongaussianity and a fixed-point algorithm," in Proc. IEEE Workshop on Machine Learning for Signal Processing (MLSP), Maynooth, Ireland, pp. 79-84, Sep. 2006. N. Correa, H. Safavi, W. Xiong, A. Roy, T. Adali, and F. Seillier-Moiseiwitsch, "Independent component analysis of simulated 2D electrophoresis gels," in Proc. IEEE Workshop on Machine Learning for Signal Processing (MLSP), Maynooth, Ireland, pp. 397-402, Sep. 2006. V. D. Calhoun, T. Adali, and J. Liu, "A feature-based approach to combine functional MRI, structural MRI and EEG brain imaging data," in Proc. IEEE Workshop on Engineering in Medicine and Biology Conf. (EMBC), New York, NY, Aug. 2006. J.-F. Cardoso and T. Adali, "The maximum likelihood approach to complex ICA," in Proc. IEEE Int. Conf. Acoust., Speech, Signal Processing (ICASSP), Toulouse, France, May 2006. V. D. Calhoun and T. Adali, "Fusion of multisubject hemodynamic and event-related potential data using independent component analysis," in Proc. IEEE Int. Conf. Acoust., Speech, Signal Processing (ICASSP), Toulouse, France, May 2006. M. Novey and T. Adali, "Stability analysis of complex-valued nonlinearities for maximization of nongaussianity," in Proc. IEEE Int. Conf. Acoust., Speech, Signal Processing (ICASSP), Toulouse, France, May 2006, (best student paper in MLSP category). Y.-O. Li, T. Adali, and V. Calhoun, "Sample dependence correction for order selection in fMRI analysis," in Proc. IEEE Int. Symp. Biomedical Imaging, Arlington, VA, April 2006. W. Xi and T. Adali, "Integrated MAP equalization and turbo product coding for optical fiber communications systems," in Proc. IEEE Globecom Conf., St. Louis, MO, pp., 1331-1336, Nov. 2005. V. D. Calhoun, T. Adali, G. Pearlson, and K. Kiehl, "Neuronal chronometry of target detection: fusion of hemodynamic and event-related potential data," in Proc. IEEE Workshop on Machine Learning for Signal Processing (MLSP), Mystic, CT, Sep. 2005. W. Wang, T. Adali, H. Li, and D. Emge, "Detection using correlation bound and its application to Raman spectroscopy," in Proc. IEEE Workshop on Machine Learning for Signal Processing (MLSP), Mystic, CT, Sep. 2005. M. Novey and T. Adali, "ICA by maximization of nongaussianity using complex functions," in Proc. IEEE Workshop on Machine Learning for Signal Processing (MLSP), Mystic, CT, Sep. 2005. H. Li, T. Adali, W. Wang, and D. Emge, "Non-negative matrix factorization with orthogonality constraints for chemical agent detection in raman spectra," in Proc. IEEE Workshop on Machine Learning for Signal Processing (MLSP), Mystic, CT, Sep. 2005. D. Mandic, D. Obradovic, A. Kuh, T. Adali, U. Trutschell, M. Golz, P. de Wilde, J. Barria, A. Constantinides, and J. Chambers, "Data fusion for modern engineering applications: An overview," in Lecture Notes in Computer Science, Proc. ICANN 2005, Part II, p. 715, Sep. 2005. W. Wang and T. Adali, "Constrained ICA and its application to Raman spectroscopy," in Proc. IEEE AP-S Int. Symp. Antennas and Propagation, July 2005. Y.-O. Li, T. Adali, and V. Calhoun, "Feature-selective ICA and its convergence properties," in Proc. IEEE Int. Conf. Acoust., Speech, Signal Processing (ICASSP), Philadelphia, PA, vol. 5, pp. 265-268, March 2005, <best student paper in MLSP category). N. Correa, Y.-O. Li, T. Adali, and V. Calhoun, "Comparison of blind source separation algorithms for fMRI using a new Matlab toolbox: GIFT," in Proc. IEEE Int. Conf. Acoust., Speech, Signal Processing (ICASSP), Philadelphia, PA, vol. 5, pp. 401-404, March 2005. W. Xi, T. Adali, and Y. Cai, "Probability distribution estimation for an integrated coding and equalization scheme in optical communications systems," in Proc. IEEE Int. Conf. Acoust., Speech, Signal Processing (ICASSP), Philadelphia, PA, vol. 3, pp. 961-963, March 2005. W. Xi, T. Adali, and J. Zweck, "Electrical estimation of conditional probability for maximum-likelihood based PMD mitigation," in Tech. Digest Optical Fiber Communications (OFC) Conf., Anaheim, CA, paper, OWJ5, March 2005. Y.-O. Li, T. Adali, and V. Calhoun, "Independent component analysis with feature selective filtering," in Proc. IEEE Workshop on Machine Learning for Signal Processing (MLSP), Saõ Luis, Brazil, Sep.-Oct. 2004. V. Calhoun and T. Adali, "Semi-blind ICA of FMRI: A method for utilizing hypothesis-derived time courses in a spatial ICA analysis," in Proc. IEEE Workshop on Machine Learning for Signal Processing (MLSP), Saõ Luis, Brazil, Sep.-Oct. 2004. T. Adali, T. Kim, and V. Calhoun, "Independent component analysis by complex nonlinearities," in Proc. IEEE Int. Conf. Acoust., Speech, Signal Processing (ICASSP), Montreal, Canada, May 2004, vol. 5, pp. 525-528. W. Xi, T. Adali, and J. Zweck, "A MAP equalizer for the optical communications channel," in Proc. IEEE Int. Conf. Acoust., Speech, Signal Processing (ICASSP), Montreal, Canada, May 2004, vol. 4, pp. 913-916. W. Wang, O. V. Sinkin, T. Adali, J. Zweck and C. R. Menyuk, "Prior-based Line-coding for WDM RZ Systems," in Proc. Conference on Lasers and Electro Optics (CLEO), San Francisco, CA, paper CFN5, May 2004. V. Calhoun, T. Adali, and L. Yiou, "Independent component analysis of complex-valued functional MRI data by complex nonlinearities," in Proc. IEEE Int. Symp. Biomedical Imaging, Arlington, VA, April 2004. T. Adali, W. Wang, and A. Lima, "Electronic equalization in optical fiber communications," in Proc. IEEE Int. Conf. Acoust., Speech, Signal Processing (ICASSP), Hong Kong, April 2003, vol. 4, pp. 497-500. V. Calhoun and T. Adali, "Complex ICA for fMRI analysis: Performance of several approaches," in Proc. IEEE Int. Conf. Acoust., Speech, Signal Processing (ICASSP), Hong Kong, April 2003, vol. 2, pp. 717-720. V. Calhoun, T. Adali, L.-K. Hansen, J. Larsen, and J. Pekar, "ICA of fMRI data: an overview," in Proc. Int. Conf. on Independent Component Analysis, Nara, Japan, March 2003 (invited). W. Xi, T. Adali, A. Lima, W. Wang, J. Zweck, and C. Menyuk, "Electrical estimation of polarization mode dispersion parameters for compensation," in Tech. Digest Optical Fiber Communications (OFC) Conf., Anaheim, CA, March 2003, vol. 1, pp. 264-265. T. Adali, "Applications of signal processing to optical fiber communications," in Proc. 15th Annual Meeting of the IEEE Lasers and Electro-Optics Society (LEOS), Glasgow, Scotland, Nov. 2002, vol. 2, pp. 623-624, (invited). W. Wang, T. Adali, W. Xi, and C. R. Menyuk, "On properties of electrical equalizers for optical communications systems," in Proc. 15th Annual Meeting of the IEEE Lasers and Electro-Optics Society (LEOS), Glasgow, Scotland, Nov. 2002, pp. 774-775. A. O. Lima, I. T. Lima, Jr., T. Adali, and C. R. Menyuk, "Comparison of power penalties due to first- and all-order PMD distortions," in Proc. 28th European Conference on Optical Communication (ECOC), Copenhagen, Denmark, Sep. 2002, PMD 1 7.1.2. V. Calhoun and T. Adali, "Complex Infomax: Convergence and approximation of Infomax with complex nonlinearities," in Proc. IEEE Workshop on Neural Networks for Signal Processing (NNSP), Martigny, Switzerland, Sep. 2002. T. Kim and T. Adali, "Universal approximation of fully complex feed-forward neural networks," in Proc. IEEE Int. Conf. Acoust., Speech, Signal Processing (ICASSP), Orlando, FL, May 2002, vol. 1, pp. 973-976. V. Calhoun, T. Adali, G.Pearlson, and J.Pekar, "On complex Infomax applied to functional MRI data," in Proc. IEEE Int. Conf. Acoust., Speech, Signal Processing (ICASSP), Orlando, FL, May 2002. A. O. Lima, T. Adali, I. T. Lima, Jr., and C. R. Menyuk, "Polarization diversity and equalization for PMD mitigation in optical communication systems," in Proc. IEEE Int. Conf. Acoust., Speech, Signal Processing (ICASSP), Orlando, FL, May 2002, vol. III, pp. 2721-2724. A. O. Lima, T. Adali, I. T. Lima, Jr., and C. R. Menyuk, "Polarization diversity receiver for PMD mitigation," in Tech. Digest Optical Fiber Communications (OFC) Conf., Anaheim, CA, March 2002, WI7, pp. 241-242. V. Calhoun, T. Adali, G. Pearlson, and J. Pekar, "Group ICA of functional MRI data: separability, stationarity, and inference," in Proc. Independent Component Analysis (ICA), San Diego, CA, Dec. 2001. T. Kim and T. Adali, "Approximation by fully complex MLP using elementary transcendental activation functions," in Proc. IEEE Workshop on Neural Networks for Signal Processing (NNSP), Falmouth, MA, Sep. 2001, pp. 203-212. V. Calhoun, T. Adali, and G. Pearlson, "Independent component analysis applied to fMRI data: A generative model for validating results," in Proc. IEEE Workshop on Neural Networks for Signal Processing (NNSP), Falmouth, MA, Sep. 2001, pp. 509-518. A. O. Lima, I. T. Lima, Jr., T. Adali, and C. R. Menyuk, "PMD mitigation using diversity detection," Digest of the LEOS Summer Topical Meetings, MD 3.3, Copper Mountain, CO, July 2001. T. Kim and T. Adali, "Nonlinear satellite channel equalization using fully complex backpropagation network," in Proc. IEEE Workshop on Nonlinear Signal and Image Processing, Baltimore, MD, June 2001. V. Calhoun, T. Adali, and G. Pearlson, "Independent component analysis applied to fMRI Data: a natural model and order selection," in Proc. IEEE Workshop on Nonlinear Signal and Image Processing, Baltimore, MD, June 2001. H. Ni and T. Adali, "On-line order selection for communications," in Proc. IEEE Int. Conf. Acoust., Speech, Signal Processing (ICASSP), Salt Lake City, UT, May 2001. T. Kim And T. Adali, "Complex backpropagation neural network using elementary transcendental functions," in Proc. IEEE Int. Conf. Acoust., Speech, Signal Processing (ICASSP), Salt Lake City, UT, May 2001. Y. Cai, J. M. Morris, T. Adali, C. R. Menyuk, "On the effects of ASE noise models on turbo code decoder performance in optical fiber transmissions," in Proc. Conference on Lasers and Electro-Optics (CLEO), Baltimore, MD, May 2001, pp. 498-499. Y. Cai, N. Ramanujam, J. M. Morris, T. Adali, G. Lenner, A. B. Puc, and A. Pilipetskii, "Performance Limit of Forward Error Correction Codes in Optical Fiber Communications," in Tech. Digest Optical Fiber Communications (OFC) Conf., Anaheim, CA, March 2001, vol. 2, TuF2, pp. 1-3. H. Ni and T. Adali, "Sequential order selection for real time signal processing," in Proc. IEEE Workshop on Neural Networks for Signal Processing (NNSP), Sydney, Australia, Dec. 2000, pp. 105-114. T. Kim and T. Adali, "Fully complex backpropagation for constant envelope signal processing," in Proc. IEEE Workshop on Neural Networks for Signal Processing (NNSP), Sydney, Australia, Dec. 2000, pp. 231-240. Y. Cai, T. Adali, Q. Xiang, X. Zhao, and F. Choa, "An adaptive equalization approach for canceling the multi-path effect in multi-mode fibers," Proc. Int. Conf. on Applications of Photonic Technology, Quebec City, Quebec, Canada, June 2000. Y. Cai, T. Adali, and C. R. Menyuk, "A line coding scheme for reducing timing jitter in WDM soliton systems," in Tech. Digest Optical Fiber Communications (OFC) Conf., Baltimore, MD, Feb. 2000, ThS4, pp. 277-279. B. Wang and T. Adali, "Time-domain equalizer design for discrete multitone systems", in Proc. IEEE Int. Conf. on Communications (ICC), New Orleans, LA, Jun. 2000. B. Wang and T. Adali, "A weighted frequency-domain least squares approach for equalization and noise suppression in discrete multitone systems", in Proc. IEEE Int. Conf. on Communications (Symposium on Communication Theory), New Orleans, LA, Jun. 2000. B. Wang and T. Adali, "Joint-impulse response shortening for discrete multitone systems," in Proc. Globecom Conf., Rio de Janeiro, Brazil, Dec. 1999, vol. 5, pp. 2508-2512. T. Adali and H. Ni, "Maximum partial likelihood methods for nonlinear signal processing," in Proc. 33rd Asilomar Conf. on Signals, Systems and Computers, Pacific Grove, CA, Oct. 1999 (invited), pp. 962-965. B. Wang and T. Adali, "A frequency-domain eigenfilter approach for equalization in discrete multitone systems" in Proc. 33rd Asilomar Conf. on Signals, Systems and Computers, Pacific Grove, CA, Oct. 1999, pp. 1058-1062. B. Wang, T. Adali, Q. Liu, and M. Vlajnic, "Generalized channel impulse response shortening for discrete multitone transceivers", in Proc. 33rd Asilomar Conf. on Signals, Systems and Computers, Pacific Grove, CA, Oct. 1999, pp. 276-280. V. Calhoun, T. Adali, and G. Pearlson, "(Non)stationarity of temporal dynamics in fMRI," in Proc. BMES/EMBS Conference, Atlanta, GA, vol. 2, Oct. 1999, p. 1079. V. Calhoun, T. Adali, and G. Pearlson, "Adaptive filtering of visual evoked responses in fMRI: variability of response," in Proc. IAESTED Conf. Signal and Image Proc. (SIP), Nassau, Bahamas, October 1999, pp. 45-48. T. Adali, "Why a nonlinear solution for a linear problem?" in Proc. IEEE Workshop on Neural Networks for Signal Processing (NNSP), Madison, WI, August 1999, pp. 157-165. H. Ni, T. Adali, and B. Wang, "Partial likelihood methods for probability density estimation," in Proc. IEEE Workshop on Neural Networks for Signal Processing (NNSP), Madison, WI, August 1999, pp. 147-156. J. I. Arribas, J. Cid-Sueiro, and T. Adali, and A. R. Figueiras-Vidal, "Neural architectures for parametric estimation of a posteriori probabilities by constrained conditional density functions," in Proc. IEEE Workshop on Neural Networks for Signal Processing (NNSP), Madison, WI, August 1999, pp. 263-272. L. Demirekler and T. Adali, "Time-domain channel equalizer for discrete multitone transceivers," in Proc. IEEE Conf. on Signal Processing and Applications (SIU), Ankara, Turkey, June 1999. B. Wang and T. Adali, "An efficient training method for equalization of discrete multitone transceivers," in Proc. IEEE/IEE Int. Conf. on Telecommunications, Cheju, Korea, June 1999, vol. 2, pp. 189-193. H. Ni and T. Adali, "A general formulation for learning multi-class posterior probabilities," in Proc. Int. Joint Conf. on Neural Networks (IJCNN), Washington, DC, July 1999, paper no. 354 (5 pages),(best paper award). J. I. Arribas, J. Cid Sueiro, and T. Adali, "Estimates of constrained multi-class a posteriori probabilities in time series problems with neural networks," in Proc. Int. Joint Conf. on Neural Networks (IJCNN), Washington, DC, July 1999, no. 352 (5 pages). J. I. Arribas, J. Cid Sueiro, and T. Adali, "Neural networks to estimate ML multi-class constrained conditional probability density functions," in Proc. Int. Joint Conf. on Neural Networks (IJCNN), Washington, DC, July 1999, no. 351 (5 pages). D. Emge and T. Adali, "Least relative entropy for voiced/unvoiced speech classification," in Proc. Int. Joint Conf. on Neural Networks (IJCNN), Washington, Washington, DC, July 1999, paper no. 350 (5 pages). A. Mishra and T. Adali, "Bayesian belief networks for effective troubleshooting," in Proc. Int. Joint Conf. on Neural Networks (IJCNN), Washington, DC, July 1999, no. 349 (5 pages). H. Ni and T. Adali, "Maximum partial likelihood estimation of multi-class posterior probabilities," in Proc. Conf. on Info. Sciences and Systems (CISS), Baltimore, MD, March 1999, pp. 93-96. L. Demirekler and T. Adali, "Joint impulse response shortening for discrete multitone transceivers," in Proc. Conf. on Info. Sciences and Systems (CISS), Baltimore, MD, March 1999, pp. 510-511. B. Wang and T. Adali, "A Frequency domain equalization approach for impulse response shortening in Discrete Multitone Systems," in Proc. Conf. on Info. Sciences and Systems (CISS), Baltimore, MD, March 1999, in pp. 480-485 (also pp. 486-491). T. Adali, H. Ni, and B. Wang, "Partial likelihood for estimation of multi-class posterior probabilities," in Proc. IEEE Int. Conf. Acoust., Speech, Signal Processing (ICASSP), Phoenix, AZ, March 1999, vol. 2, pp. 1053-1056. V. Calhoun, T. Adali, M. Kraut, P. Rivkin, and G. Pearlson, "Visualizing spatially distributed hemodynamic lag times in event-related functional MRI: Estimation of a characteristic visual impulse response," Proc. 20th Annual Int. Conf. of the IEEE Eng. on Med. and Bio. Soc., Hong Kong, Nov. 1998, pp. 2124-2125. S. Kadambe and T. Adali, "Application of cross-term deleted Wigner representation (CDWR) for sonar target detection/classification," Proc. 32nd Asilomar Conf. on Signals, Systems and Computers, Pacific Grove, CA, Nov. 1998 (invited). T. Adali, "A general probabilistic formulation for neural classifiers," in Proc. IEEE Workshop on Neural Networks for Signal Processing (NNSP), Cambridge, England, Sep. 1998, pp. 145-154. B. Wang, T. Adali, X. Liu, and J. Xuan, "Partial likelihood for real-time signal processing with finite normal mixtures," in Proc. IEEE Workshop on Neural Networks for Signal Processing (NNSP), Cambridge, England, Sep. 1998, pp. 244-253. T. Adali, B. Wang, X. Liu, and J. Xuan, "A likelihood framework for nonlinear signal processing with finite normal mixtures," in Proc. 1998 European Conference on Signal Processing (EUSIPCO), Rhodes, Greece, Sep. 1998, pp. 561-564. L. Demirekler, T. Adali, and X. Liu, "Piecewise linear decision feedback equalizers," in Proc. 1998 European Conference on Signal Processing (EUSIPCO), Rhodes, Greece, Sep. 1998, pp. 1409-1412. V. Calhoun, T. Adali, and G. Pearlson, "A frequency-space approach for motion correction in functional MRI," in Proc. Image and Multidimensional Signal Processing (IMDSP) Workshop, July 1998, Alpbach, Austria, p. 229. X. Liu, T. Adali, and L. Demirekler, "A piecewise linear recurrent neural network structure and its dynamics,"in Proc. IEEE Int. Conf. Acoust., Speech, Signal Processing (ICASSP), Seattle, WA, May 1998. T. Adali, B. Wang, A.N. Pilipetskii, C. R. Menyuk, " A signal processing approach for effective reduction of timing jitter due to the acoustic effect," in Proc. IEEE Int. Conf. Acoust., Speech, Signal Processing (ICASSP), Seattle, WA, May 1998. J. Xuan, Y. Wang, T. Adali, Q. Zheng, W. Hayes, M. T. Freedman, and S. K. Mun, "A deformable surface-spine model for 3-D surface registration," in Proc. IEEE Int. Conf. on Image Processing (ICIP) , Santa Barbara, CA, Nov. 1997. X. Liu and T. Adali, "Recurrent canonical piecewise linear network: theory and application in blind equalization," in Proc. IEEE Workshop on Neural Networks for Signal Processing (NNSP), Amelia Island, FL, Sep. 1997, pp. 446-455. Y. Wang, T. Adali, and S.-Y. Kung, "Medical image analysis by probabilistic modular neural networks," in Proc. IEEE Workshop on Neural Networks for Signal Processing (NNSP), Amelia Island, FL, Sep. 1997, pp. 654-663. T. Adali, N. Gupta, and Y. Wang, "A multi-resolution segmentation scheme and its application to edge detection in cardiac MR image sequences," in Proc. DSP'97, Santorini, Greece, July 1997, pp. 1135-1139. N. Li, T. Adali, and M. NessAiver, "Magnetic resonance image reconstruction from non-equidistantly sampled data," in Proc. IEEE Int. Conf. Acoust., Speech, Signal Processing (ICASSP), Munich, Germany, April 1997, pp. 2829-2832. X. Liu and T. Adali, "Recurrent canonical piecewise linear network for blind equalization," in Proc. IEEE Int. Conf. Acoust., Speech, Signal Processing (ICASSP), Munich, Germany, April 1997, pp. 3213-3216. X. Liu, T. Adali, S. Kadambe, and J. Xuan, "Hierarchical predictive feature extraction for neural network based speaker-independent isolated word recognition," in Proc. Conf. on Info. Sciences and Systems (CISS), Baltimore, MD, March 1997, pp. 552-555. J. Xuan, T. Adali, Y. Wang, W. Hayes, M. Freedman, and S. K. Mun, "Information visualization of localized prostate cancer," in Proc. Conf. on Info. Sciences and Systems (CISS), Baltimore, MD, March 1997, p. 902. T. Adali and X. Liu, "Blind equalization using RCPL network," in Proc. Conf. on Info. Sciences and Systems (CISS), Baltimore, MD, March 1997,p. 806. M. NessAiver, N. Li, T. Adali, and Terry Turpin "Optical reconstruction of echo-planar MRI data sets," in Proc. SPIE Medical Imaging Conf., Newport, CA, Feb. 1997, SPIE vol. 3032, pp. 256-264. J. Xuan, I. A. Sesterhenn, W. S. Hayes, Y. Yagi, Y. Wang, T. Adali, M. T. Freedman, and S. K. Mun, "Surface reconstruction and visualization of the surgical prostate model," in Proc. SPIE Medical Imaging Conf., Newport, CA, Feb. 1997, pp. 50-61. J. Xuan, T. Adali, E. Siegel, and Y. Wang "Image quality evaluation for radiation dose optimization in CR by shape analysis and wavelet analysis," in Proc. 1996 European Conf. on Signal Processing (EUSIPCO), Trieste, Italy, Sep. 1996, pp. 383-386. X. Liu and T. Adali, "Channel equalization using partial likelihood estimation and recurrent canonical piecewise-linear neural network," in Proc. 1996 European Conf. on Signal Processing (EUSIPCO), Trieste, Italy, Sep. 1996, pp. 1973-1976. T. Adali and X. Liu, "Canonical piecewise linear network for nonlinear filtering and its application to blind equalization," in Proc. Fourth Bayona Workshop on Intelligent Methods in Signal Proc. and Comm., Bayona-Vigo, Spain, June 1996, pp. 34-38. T. Adali, X. Liu, and M. K. Sönmez, "Distribution learning by partial likelihood estimation and dynamics of relative entropy minimization," in Proc. Fourth Bayona Workshop on Intelligent Methods in Signal Proc. and Comm., Bayona-Vigo, Spain, June 1996, pp. 39-43. X. Liu and T. Adali, "Recurrent canonical piecewise neural network and its application to adaptive equalization," in Proc. IEEE Int. Conf. on Neural Networks (ICNN), Washington, DC, June 1996, pp. 1969-1973. T. Adali, M. K. Sönmez, and X. Liu, "Partial likelihood estimation for real-time signal processing," in Proc. IEEE Int. Conf. Acoust., Speech, Signal Processing (ICASSP), Atlanta, GA, vol. 6, May 1996, pp. 3562-3565. Y. Wang and T. Adali, "Efficient learning of finite normal mixtures for image quantification," in Proc. IEEE Int. Conf. Acoust., Speech, Signal Processing (ICASSP), Atlanta, GA, vol. 6, May 1996, pp. 3423-3426. J. Xuan, T. Adali, and X. Liu, "Information geometry of maximum partial likelihood estimation for estimation for channel equalization," in Proc. IEEE Int. Conf. Acoust., Speech, Signal Processing (ICASSP), Atlanta, GA, vol. 6, May 1996, pp. 3534-3537. J. Xuan and T. Adali, "Task-specific segmentation for remote sensing images," in Proc. Int. Geoscience and Remote Sensing Symposium (IGARSS), Lincoln, NE, May 1996, vol. 1, pp. 700-702 (invited). Y. Wang, T. Adali, M. T. Freedman, and S. K. Mun, "MR brain image analysis by distribution learning and relaxation labeling," in Proc. 15th IEEE Southern Biomedical Engineering Conf., Dayton, OH, March 1996, pp. 133-136 (invited), also in J. Long-Term Effects of Medical Implants (special issue). C. Lau, T. Adali, and Y. Wang, "Co-registration of PET/MR brain images by multi-feature correlation matching," in in Proc. 15th IEEE Southern Biomedical Engineering Conf., Dayton, OH, March 1996, pp. 301-304 (invited), also in J. Long-Term Effects of Medical Implants (special issue). T. Adali, X. Liu, and M. K. Sönmez, "Partial likelihood for signal processing with neural networks and its application to channel equalization," in Proc. 30th Annual Conf. on Info. Sciences and Systems (CISS), Princeton, NJ, March 1996, pp. 1049-1054 (invited). N. Gupta, T. Adali, and M. NessAiver, "Temporal processing of cardiac MR image sequences for endocardial contour detection," in Proc. SPIE Medical Imaging Conf., Newport, CA, Feb. 1996, SPIE vol. 3032, pp. 256-264. J. Xuan and T. Adali, "Segmentation of magnetic resonance brain image: integrating region growing and edge detection," in Proc. IEEE Int. Conf. on Image Processing (ICIP), Washington, DC, Nov. 1995, vol. 3, pp. 544-547}. B. Bakal, T. Adali, and R. Fakory, "Time-delay neural networks for preprocessing of incomplete data and prediction of gas emissions in fossil fuel plants," in Proc. 10th Int. Symp. on Computer and Info. Sciences (ISCIS), Izmir, Turkey, Oct. 1995, pp. 771-778. N. Gupta, T. Adali, and M. NessAiver, "Automatic left ventricular boundary detection for cardiac MR sequences," in Proc. 10th Int. Symp. on Computers and Info. Sciences (ISCIS), Izmir, Turkey, Oct. 1995, pp. 79-86. T. Adali, X. Liu, M. K. Sönmez, and N. Li, "A partial likelihood framework for the analysis of LRE Algorithm: A distribution learning approach for adaptive equalization," Proc. IEEE Workshop on Neural Networks for Signal Processing (NNSP), Boston, MA, Sep. 1995, pp. 541-550. B. Bakal, T. Adali, R. Fakory, D. Komo, M. K. Sönmez, and O. Tsaoi, "Modeling core neutronics by recurrent neural networks," in Proc. World Congress on Neural Networks (WCNN), Washington, DC, July 1995, vol. 2, pp. 504-508. B. Bakal, T. Adali, M. K. Sönmez, and R. Fakory, "Time delay neural networks for NOx and CO prediction in fossil fuel plants," in Proc. of World Congress on Neural Networks (WCNN), Washington, DC, July 1995, vol. 3, pp. 111-115. J. Xuan and T. Adali, "Learning tree-structured vector quantization for image compression," in Proc. World Congress on Neural Networks (WCNN), Washington, DC, July 1995, vol. 1, pp. 756-759. Y. Wang, T. Adali;, and C. Lau, “Quantification of computed medical images by neural network histogram analysis,” in Proc. World Congress on Neural Networks (WCNN), Washington, DC, July 1995, vol. 2, pp. 811--814. N. Li, T. Adali;, and X. Liu, “Finite alphabet least relative entropy algorithm for channel equalization,” in Proc. World Congress on Neural Networks (WCNN), Washington, DC, July 1995, vol. 3, pp. 7679. B. Bakal, T. Adalı, R. Fakory, D. Komo, M. K. S¨onmez and C. O. Tsaoi, “Simulation of nuclear reactor core dynamics by recurrent neural networks,” in Computer-Based Human Support Systems: Technology, Methods and Future, Philadelphia, PA, June 1995, pp. 475479. T. Adalı, M. K. S¨onmez, and K. Patel, “On the dynamics of the LRE algorithm: A distribution learning approach to adaptive equalization,” in Proc. IEEE Int. Conf. Acoust., Speech, Signal Processing (ICASSP), Detroit, MI, May 1995, pp. 929932. B. Bakal, T. Adalı, R. Fakory, D. Komo, M. K. S¨onmez, and O. Tsaoi, “Neural network simulation of real-time core neutronic model,” in Proc. SCS Simulation Multiconference, Phoenix, AZ, April 1995, pp. 160165. B. Bakal, T. Adalı, M. K. S¨onmez, and R. Fakory, “NOx and CO prediction in fossil fuel plants by neural networks,” in Proc. SCS Simulation Multiconference, Phoenix, AZ, April 1995, pp. 110. X. Liu and T. Adalı, “Channel equalization by maximum partial likelihood estimation,” in Proc. Conf. on Info. Sciences and Systems (CISS), Baltimore, MD, March 1995, pp. 674678. J. Xuan, T. Adalı, Y. Wang, and R. Steinman, “Predictive tree-structured vector quantization for medical image compression and its evaluation by computerized image analysis,” in Proc. SPIE Medical Imaging Conf., San Diego, CA, Feb. 1995, SPIE vol. 2431, pp. 2572431. T. Adalı and Y. Wang, “Probabilistic neural networks for medical image quantification,” in Proc. IEEE Int. Conf. on Image Processing (ICIP), Austin, TX, Nov. 1994, vol. 3, pp. 889892. Y. Wang, T. Lei, and T. Adalı, “Hidden MRF model-based algorithms for NMR image analysis,” in Proc. IEEE Nuclear Science Symp. and Medical Imaging Conf., Norfolk, VA, Nov. 1994, vol. 3, pp. 14481452. T. Adalı, Y. Wang, and N. Gupta, “Block-wise segmentation via vector quantization for medical image analysis,” in Engineering Advances: New Opportunities for Biomedical Engineers, N. F. Sheppard, Jr., M. Eden, and G. Kandor editors, Nov. 1994, vol. 16, pp. 722723. Y. Wang, T. Adalı, and T. Lei, “Unsupervised medical image analysis by multiscale FNM modeling and MRF relaxation labeling,” in Proc. IEEE Workshop on Information Theory and Statistics, Alexandria, VA, Oct. 1994, p. 101. Y. Wang and T. Adalı, “Probabilistic neural networks for parameter quantification in unsupervised medical image analysis,” in Biomedical Engineering Recent Developments, J. Vossoughi editor, Washington, DC, April 1994, pp. 669672 (best student paper award). T. Adalı and M. K. S¨onmez, “Channel equalization with perceptrons: an information theoretic approach,” in Proc. IEEE Int. Conf. Acoust., Speech, Signal Processing (ICASSP), Adelaide, Australia, April 1994, vol 3, pp. 297300. S. H. Ardalan and T. Adalı, “DSP and communications education with graphical block diagram simulation tools,” in Proc. IEEE Int. Conf. Acoust., Speech, Signal Processing (ICASSP), Adelaide, Australia, April 1994, vol. 4, pp. 5760. M. K. S¨onmez and T. Adalı, “Channel equalization by distribution learning: the least entropy algorithm,” in Applications of Neural Networks to Telecommunications, J. Alspector, R. Goodman, and T. X. Brown editors, Princeton, NJ, Oct. 1993, pp. 218224. M. K. S¨onmez and T. Adalı, “Least relative entropy channel equalization,” in Proc. 27th Annual Conf. on Info. Sciences and Systems (CISS), Baltimore, MD, March 1993, pp. 916921 (invited). T. Adalı and S. H. Ardalan, “Effects of signal quantization on recursive least squares algorithms,” in Proc. 27th Annual Conf. on Info. Sciences and Systems (CISS), Baltimore, MD, March 1993, pp. 241245. T. Adalı and S. H. Ardalan, “A mobile communications application in block diagram simulator Capsim,” in Simulators X, Simulation Series, vol. 25, no. 4, March 1993, pp. 535540. T. Adalı, S. H. Ardalan, and A. S. Sadri, “Multichannel general order FTF algorithm and its application to the equalization of mobile communication channels,” in Proc. IEEE Int. Conf. Acoust., Speech, Signal Processing (ICASSP), San Francisco, CA, vol. 4, March 1992, pp. 517520. T. Adalı and S. H. Ardalan, “Fixed-point roundoff error analysis of the RLS algorithm with time-varying channels,” in Proc. IEEE Int. Conf. Acoust., Speech, Signal Processing (ICASSP), Toronto, Ontario, Canada, May 1991, pp. 18651868. T. Adalı and S. H. Ardalan, “Fixed-point roundoff error analysis of the RLS algorithm,” in Adaptive Control and Signal Processing, M. H. Hamza editor, 1990, pp. 4043. T. Adalı and S. H. Ardalan, “Convergence and error analysis of the fixed-point transversal RLS algorithm,” in Proc. IEEE Int. Conf. Acoust., Speech, Signal Processing (ICASSP), Albuquerque, NM, April 1990, pp. 14791482. T. Adalı and S. H. Ardalan, “A new stabilization technique for the fixed-point prewindowed RLS algorithm,” in Proc. Bilkent Int. Conf. New Trends in Comm., Contr., Signal Processing Ankara, Turkey, July 1990, pp. 12911297. T. Adalı and S. H. Ardalan, “Steady-state and convergence characteristics of the fixed-point RLS algorithm,” in Proc. IEEE Int. Symp. on Circuits and Systems (ISCAS), New Orleans, LA, May 1990, pp. 788791. S. H. Ardalan and T. Adalı, “Sensitivity analysis of transversal RLS algorithms with correlated inputs,” in Proc. IEEE Int. Symp. on Circuits and Systems (ISCAS), Port land, OR, May 1989, pp. 17441747. Investigating associations across fMRI, sMRI, and EEG data for the auditory oddball task using canonical correlation analysis," NeuroImage, vol. 47, supplement 1, July 2009, p. S101. J. Sui, Y-O. Li, T. Adali and V. D. Calhoun, ""A new joint blind source separation model for two datasets and Its application to second-level fMRI group analysis," NeuroImage, vol. 47, supplement 1, July 2009, p. S1240. J. Sui, T. Adali G. Pearlson, and V. D. Calhoun, "An automatic artifact removal method for independent components derived from second-level fMRI analysis," NeuroImage, vol. 47, supplement 1, July 2009, p. S81. J. Sui, T. Adali G. Pearlson, and V. D. Calhoun, "Identification of optimal fMRI components using combined group-discriminative techniques," NeuroImage, vol. 47, supplement 1, July 2009, p. S135. Y. Wang, B. Zhang, S. Roys, N, Correa, T. Adali and R. Gullapalli, "Kinetic parameter estimation of independent components derived from simulated dynamic contrast enhanced breast MRI data ," in Proc. 13th Annual Mtg. Human Brain Mapping, Chicago, IL, June 2007. T. Adali and H. Li, "Signal processing with complex nonlinearities," in Proc. Learning Workshop, Snowbird, Utah, April 2005. T. Adali "A general framework for learning in the complex domain and its applications," in Proc. Learning Workshop, San Juan, Puerto Rico, March 2007. S. Sheriff, D. Lefkowitz, S. Roys, T. Adali and R. Gullapalli, "Novel initialization technique for expectation-maximization based image segmentation: quantification and validation," in Proc. Int. Soc. Magnetic Resonance in Medicine (ISMRM), Toronto, ON, Canada, July 2003. R. Arya, V. Calhoun, T. Adali S. Roys, J. Greenspan, and R. Gullapalli, "Comparative study of several multivariate fMRI processing methods: PCA, factor analysis, Infomax, FASTICA, MELODIC," in Proc. ISMRM, Toronto, ON, Canada, July 2003. V. Calhoun, J. Pekar, T. Adali and G. Pearlson, "An fMRI analysis of driving-related networks with independent component analysis applied in a between-condition (BC-ICA) and within-condition (WC-ICA) manner," in Proc. ISMRM, Glasgow, Scotland, 2001, p. 668. V. Calhoun, J. Pekar, T. Adali and G. Pearlson, "fMRI of visual perception: networks identified by SPM and independent component analysis," in Proc. ISMRM, Glasgow, Scotland, 2001. B. Wang, and T. Adali "Frequency-domain approaches for equalizer design for discrete multitone systems," Broadband Access Technologies Workshop, Nortel Networks, Nepean, Ontario, Canada, Apr. 2000. Y. Wang, T. Adali C-M. Lau, and Z. Szabo, "Quantification of MR brain images by a probabilistic self-organizing map," Radiology (Supplement Issue), Vol. 197 (P), Nov. 1995, p. 252 (summary). T. Adali "Nonlinear channel equalization", in Proc. IEEE Signal Processing Workshop, Washington, DC, March 1995 (invited). T. Adali B. Bakal, R. Fakory, D. Komo, M. K. Sonmez, and O. Tsaoi, "Dynamic system modeling with neural networks," in Proc. GSE Systems Users Conf., Columbia, MD, Sep. 1994. T. Adali, C. Jutten, and L.-K. Hansen, Special Issue on Multi-modal Data Fusion, Proc. IEEE, vol. 103, no. 9, Sep. 2015. Machine Learning for Signal Processing XIX, Proc. of the 2014 IEEE Workshop, M. Mboup, T. Adali, and E. Moreau (editors), IEEE Press, Piscataway, NJ, 2014. Special Issue on Source Separation and Applications, IEEE Signal Processing Magazine, T. Adali, C. Jutten, A. Yeredor, A. Cichocki, and E. Moreau, (guest editors), vol. 31, no. 3, May 2014. Special Issue on Advances in Kernel-based Learning for Signal Processing, K. R. Muller, T. Adali, K. Fukumizu, J. Principe, and S. Theodoridis, (guest editors) IEEE Signal Processing Magazine, vol. 30, no. 4, July 2013. Machine Learning for Signal Processing XIX, Proc. of the 2009 IEEE Workshop, C. Jutten, T. Adali, J. Chanussot, J. Larsen, (editors), IEEE Press, Piscataway, NJ, 2009. Independent Component Analysis and Signal Separation: Proc. of the 2009 8th Int. Conf., ICA 2009, Lecture Notes in Computer Science, T. Adali, C. Jutten, J.-M. T. Romano, and A. K. Barros, Paraty, Brazil, March 15-18, 2009, Springer. Machine Learning for Signal Processing XVIII, Proc. of the 2008 IEEE Workshop, J. Principe, D. Erdogmus, T. Adali, J. Larsen, (editors), IEEE Press, Piscataway, NJ, 2008. Machine Learning for Signal Processing XVII, Proc. of the 2007 IEEE Workshop, K. Diamantaras, T. Adali, I. Pitas, T. Papadimitriou, and S. Douglas (editors), IEEE Press, Piscataway, NJ, 2007. MachineLearningforSignalProcessingXVI,Proc.ofthe2006IEEEWorkshop,S.McLoone, T. Adali, J. Larsen, M. Van Hulle, A. Rogers, and S. Douglas (editors), IEEE Press, Piscataway, NJ, 2006. IEEE Engineering in Medicine and Biology Magazine, Functional MRI: Our Window onto the Brain, T. Adali, and V. D. Calhoun (editors), vol. 25, no. 2, March/April 2006. Machine Learning for Signal Processing XV, Proc. of the 2005 IEEE Workshop, V. D. Calhoun, T. Adali, J. Larsen, D. J. Miller, and S. Douglas (editors), IEEE Press, Piscataway, NJ, 2005. Machine Learning for Signal Processing XIV, Proc. of the 2004 IEEE Workshop, A. K. Barros, J. Principe, J. Larsen, T. Adali, and S. Douglas (editors), IEEE Press, Piscataway, NJ, 2004. Double Special Issue: Biomedical and Communications Applications of Neural Networks, Journal of VLSI Signal Processing Systems for Signal, Image, and Video Technology, Springer, vol. 37, no. 2/3, June/July 2004. D. J. Miller, T. Adali, J. Larsen, M. Van Hulle (guest editors). Neural Networks for Signal Processing XIII, Proc. of the 2003 IEEE Workshop, C. Molina, T. Adali, J. Larsen, M. Van Hulle, S. Douglas, J. Rouat (editors), IEEE Press, Piscataway, NJ, 2003. Neural Networks for Signal Processing XII, Proc. of the 2002 IEEE Workshop, H. Bourlard, T. Adali, J. Larsen, S. Bengio, and S. Douglas (editors), IEEE Press, Piscataway, NJ, 2002. Special Issue on Neural Networks for Signal Processing, Journal of VLSI Signal Processing Systems for Signal, Image, and Video Technology, vol. 32, nos. 1/2, Aug. and Sep. 2002, M. Van Hulle, J. Larsen, and T. Adali, (guest editors). NeuralNetworksforSignalProcessingXI,Proc.ofthe2001IEEEWorkshop,D.J.Miller, T. Adali, J. Larsen, M. Van Hulle, and S. Douglas (editors), IEEE Press, Piscataway, NJ, 2001. Special Issue on Neural Networks for Signal Processing, Journal of VLSI Signal Processing Systems for Signal, Image, and Video Technology, vol. 26, nos. 1/2, Aug. 2000, T. Adali, M. Van Hulle, M. Niranjan (guest editors). Neural Networks for Signal Processing X, Proc. of the 2000 IEEE Workshop, B. Widrow, L. Guan, K. Paliwa, T. Adali, J. Larsen, E. Wilson, and S. Douglas (editors), IEEE Press, Piscataway, NJ, 2000. Special Issue on Applications of Neural Networks in Biomedical Image Processing, Journal of VLSI Signal Processing Systems for Signal, Image, and Video Technology, vol. 18, no. 3, April 1998, T. Adali, (guest editor).